“Foreseen Scriptures” RELEASE UPDATE!!! WE ARE PUSHING RELEASE DATE AND SHOW TO 7-13-19 / TXDM FEST X at Tomcats West in Fort Worth, TEXAS!!! Our brother / Bassist Allen Culmo must have Heart Surgery May 2nd. We must allow him FULL RECOVERY TIME and SUPPORT. All PRE-ORDERS WILL BE SHIPPED AS SOON AS C.D.’s ARRIVE FROM MANUFACTURER!!! PRE-ORDER YOURS TODAY!!! The 1st OFFICIAL PROPHECY DVD, “In The Beginning…” will also be RELEASED at TXDM FEST X – SATURDAY, JULY 13, 2019!!!!!!! This DVD has the first videos IN EXISTENCE of PROPHECY from 1993 and 1994 as well as band members, past and present, interviewed 20 years later in 2014!!!!!!! The NEW FULL LENGTH, “Foreseen Scriptures” is almost ready to go to press!!! Mixing and mastering is next along with NEW T-Shirts, Long Sleeve, and Hoodie designs, “Foreseen Scriptures” will be released June 1st on Prophecy Records!!! Formats will be old school Compact Disc and Digital!!! April 6th is FREE ENTRY FOR EVERYONE to attend the Official Music Video Shoot of the 2nd promotional single, “Buried In Brimstone” at Tomcats West in Fort Worth, TEXAS from noon to 3-4 PM!!! Pre-Order “Foreseen Scriptures” April 1st to May 1st from the Official PROPHECY E-store / Website!!! Stay UP TO DATE with ALL THINGS PROPHECY at the Official PROPHECY E-store / Website and the Official PROPHECY FB page!!! All Official PROPHECY videos on the Official PROPHECY YouTube Channel!! As always, we thank you for your dedicated support!!! Sincerely! James Parks II, Allen Culmo, Trevor Scott, Charlie Porter, and Drew Duffy!!!!! “Foreseen Scriptures” PRE-ORDERS BEGIN April 1st, 2019 and ENDS May 1st, 2019!!! “Foreseen Scriptures” will be released June 1st, 2019 on Prophecy Records!!! PROPHECY’s NEW FULL LENGTH, “Foreseen Scriptures”…Drums, Guitars, Bass, Harmony Guitars, and Solo’s are tracked!!! Vocals are set to begin tracking 1-20-19!!! PRE-ORDERS will begin VERY SOON!!! TRACKING UPDATE!!! “Foreseen Scriptures” – Drums, Guitars, and Bass tracking is finished!!! Expect “Foreseen Scriptures” to be released early 2019 on Prophecy Records!!! 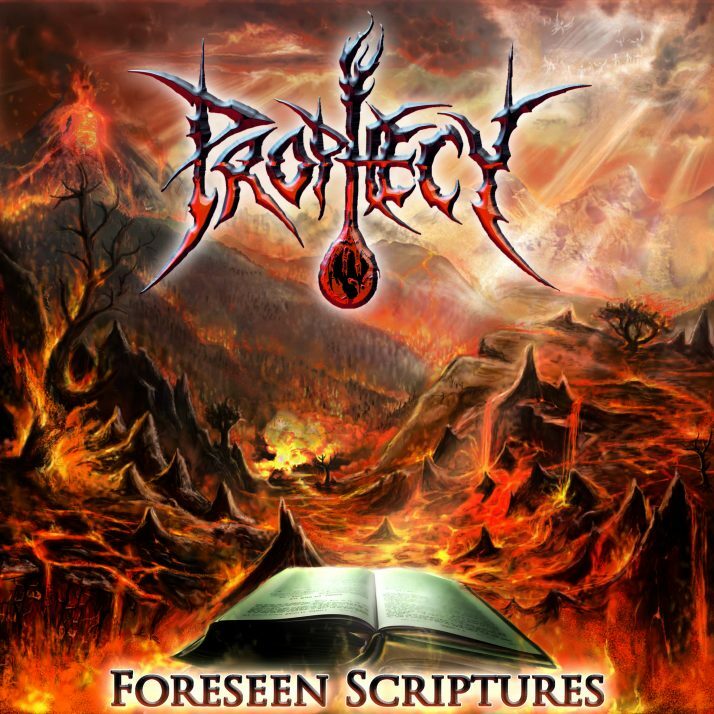 PROPHECY’s 2nd promotional single from their NEW full length, “Foreseen Scriptures” is “Buried In Brimstone”. Release date for “Buried In Brimstone” and promotional video will be announced A.S.A.P!!! NEW “Buried In Brimstone” T.S. (T-Shirt) is AVAILABLE NOW in CLOTHING page! PROPHECY is set to begin recording the NEW FULL LENGTH RELEASE, “Foreseen Scriptures” on May 5th, 2018!!! “Foreseen Scriptures” will be released late 2018 / early 2019 on Prophecy Records!!! Subscribe to the official PROPHECY YouTube Channel to hear and see the new songs to be on “Foreseen Scriptures”!!! WELCOME Drew Duffy as the new lead vocalist of PROPHECY!! WELCOME Drew Duffy as the new lead vocalist of PROPHECY!! We made it official on 9-26-17!! Check out his performance with us HERE!!! 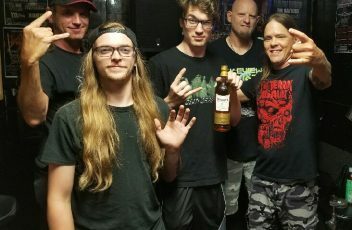 8-9-17 PROPHECY is hitting the road for their first U.S. HEADLINING TOUR!!! Check our SHOWS / TOURS page for all the details! PROPHECY Tour shirts and posters and ALL PROPHECY MERCH and MUSIC will be available to purchase while on tour! All tour merch not sold, will be on sale HERE! Check our CLOTHING and ACCESSORIES pages after the tour! PROPHECY would like to THANK EVERYONE for supporting us throughout the years and hope to meet you in person while on tour!!! SEE YOU IN THE PIT, AMERICA!!! Prophecy announces the creation of its new website. 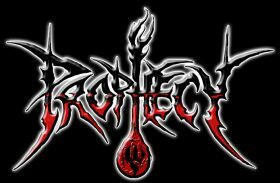 In close consultation with Prophecy’s founder/leader, James Parks II, the creation of the site is an on-going project which has proven to be a much-needed focal point for fans of the band. 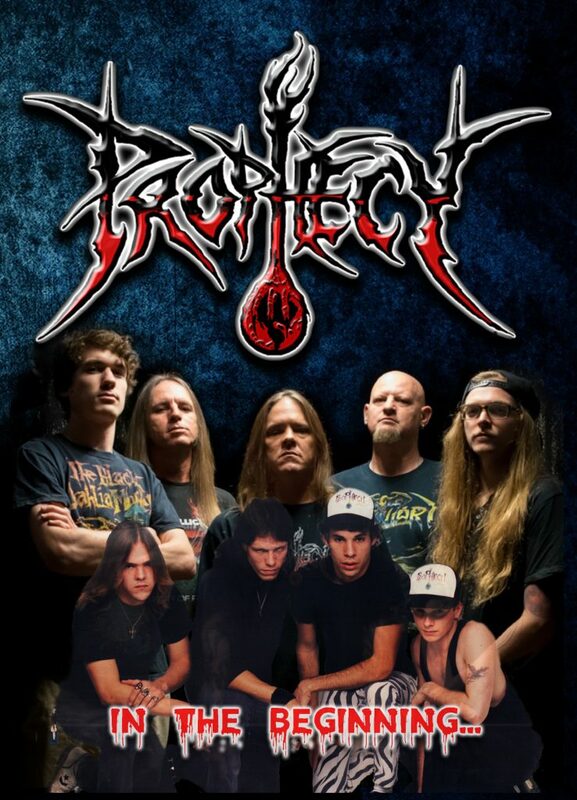 Now celebrating 25 years as one of the top-rated bands in the Dallas / Fort Worth area, Prophecy is proud to introduce prophecystore.com, the first on-line location where both music and clothing are offered to its many fans.